Cork County Junior & Senior XC Champs 2014, Slieveroe, Riverstick, Co. Cork, Sun 02-Nov-2014, 12pm — St. Finbarr's A.C.
Ladies Senior XC 2013, Slieveroe, Riverstick, Co. Cork. The Cork County Junior & Senior Cross Country Championships, the premiere club event of the year, take place on Sunday 02nd of November 2014. 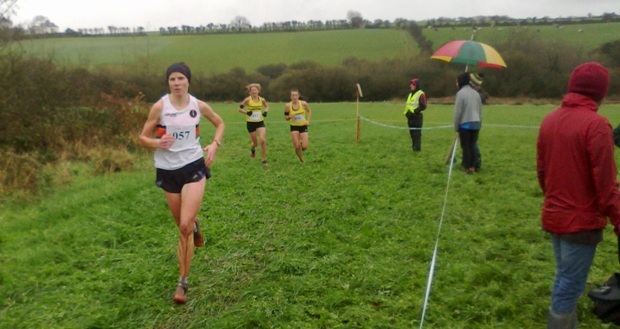 The venue is the dedicated XC site owned by the Cork AAI at Slieveroe, Riverstick. Events kick off with the Junior races at 12pm followed by the Senior Ladies and concluding with the Senior Men. The inaugural Senior XC at this venue last year was a great success and a memorable day out for all those who attended. The standard route to this venue is via Riverstick. Head for the Airport roundabout, continuing onward for Kinsale (R600) and turning left at Riverstick for Carrigaline. According to the organisers, the main routes will be signposted, with 3 Miles, 2 Miles and 1 Mile to go signs. For those comming from the Carrigaline direction, take a right onto the L2494 Riverstick road, shortly after leaving Carrigaline. For the intrepid explorer, an alternative route saves about 2km, but is unsuitable for heavy vehicles. About 7km from the Airport roundabout (R600) turn left onto the L2493. Take the 1st right. Straight on for 3km. At the next junction (Pink House) turn left. At the next junction, left again onto the L2494 for Carrigaline. Trust your SAT-NAV and don’t panic!